If anybody knows about strength conditioning, it’s John Brookfield. John is a Guinness Record holding strong man, who has done some amazing feats in his life. He’s done such things as pull a 24,000 lb. truck a full mile and use a 50 lb. Sledgehammer for over an hour, hitting a tire about 30 times a minute. Obviously, John also knows about stamina conditioning as well! He’s also an author of four books on strength conditioning and is the inventor of the Battling Rope and it’s associated exercises. So, you can rely on the fact that when you use a Battling Rope to exercise and condition yourself, you’re using a product that will do what it’s intended to do, since it’s inventor knows what he’s doing! The concept behind the Battling Rope is quite simple, as all great inventions are. It’s simply a long length of rope that’s either attached to a wall or doubled up and slipped over a metal pole. You exercise by using a sort of whipping motion with your arms. The idea of these exercises is to build strength, yes, but it’s a strength that has a lasting power. It’s all about duration. The undulating motions use muscles rarely used in the arms, back, and abdomen, and since you do these motions repeatedly over and over, in time it will build incredible stamina. This is stamina that you can count on in hard situations, be it sports or other physical activities. The exercises are fairly unique. As you work out, you will find that you both push and pull simultaneously, as well as performing isometric exercises. This builds hard strength and stamina in the most efficient way in the shortest amount of time. 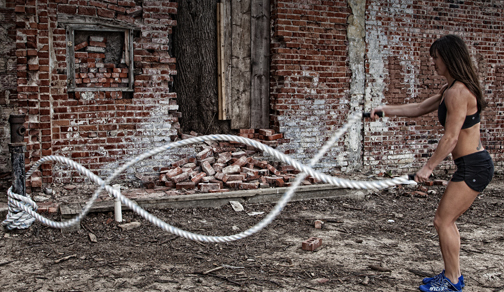 Weight lifting builds strength, too, but nothing can give you the sustainable strength that using a Battling Rope can. The system will also build incredible grip strength, as John has one of the strongest grips in the world (he has ripped 100 full decks of playing cards in half in under three minutes, if that’s any indication as to how strong his grip is). SPORTSMITH carries three lengths of Battling Rope, in 40’, 50’, and 60’ lengths. These ropes are 1 and 1/2" thick and are made of durable polyester, with a rubber boot at the end to prevent unraveling. If the proper usage instructions are followed, they will last you a very long time indeed. For more information on battling rope click here. Currently, the military has recently taken up using the Battling Rope to condition it’s elite operatives for missions that might involve them using their physical strength and stamina under long term conditions. Law enforcement agencies have also began using the Battling Rope to better condition their officers, and many professional sports teams have been using the Ropes for some time now, as have Mixed Martial Arts fighters. With a pedigree like one of the world’s strongest men as it’s inventor, the Battling Rope is a unique item, and one that’s sure to be around for a long time to come.